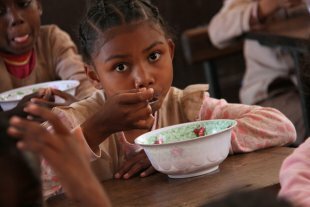 The World’s Biggest School Meal Program Is Keeping Local Farmers in Business | "Global Possibilities"
Emphasizing local food under a radical policy of “zero hunger,” Brazil’s school lunch initiative helps small farmers buy the land they’ve been farming for generations. At an elementary school in Brazil’s capital, students are not too concerned about who has produced their food as they bite into an afternoon snack of pineapple and watermelon. Nevertheless, they are among 45 million students benefiting from the world’s biggest universal school feeding program, whose meals are helping keep Brazil’s small farmers on their land. Family farmers and cooperatives have seen their fortunes rise as a result of the program, which guarantees them a local market and has helped to expand formal land rights nationwide. “Incomes have increased significantly because of it,” said Amanda Venturim, agricultural adviser to a cooperative of 56 small farmers outside Brasilia. “The government makes a contract with us beforehand, so farmers know how much food they need to produce and how much they will receive,” said Venturim, standing beside vast grain elevators on the dry savannah that surrounds the capital. The cooperative has been selling food to the government for school meals for three years, she said, enabling farmers to invest in new equipment and to retain control of their land. Local preferencesFirst developed in the 1950s, Brazil’s school feeding initiative has expanded rapidly over the past decade or so as part of a successful push for “zero hunger” in Latin America’s most populous country. About a quarter of Brazilians receive free meals under the program. Brazil has about 5 million small farms, according to the U.N.’s Centre of Excellence Against Hunger in Brasilia. These farmers are some of the prime beneficiaries of hundreds of millions of dollars of government spending on school meals. A 2009 law stipulates that authorities must spend at least 30 percent of their school meal budget on produce from smallholder farmers. At the elementary school in south Brasilia, nutritionist Sumara de Oliveira Santana said the law is helping farmers to stay on the land because it encourages local production. “Smallholder farmers and local producers have priority when we buy food for the schools,” said Santana as she supervised several dozen rowdy students during snack break. For their part, the kids were not too concerned with the details of land politics. Landed farmersMost of Brazil’s food—about 70 percent of what’s consumed in the country—comes from small farmers, according to the U.N. About three-quarters of these small farms are owned by farmers who have official land title deeds, according to government data. Access to a guaranteed market through the feeding program allows small farmers to keep control of their land, Venturim said. Farmers say they now know roughly how much they will be earning each year and can apply for credit and other government support due to their participation in the initiative. It means they don’t have to migrate to cities in search of work, unlike many farmers in the developing world who leave their land in the hopes of earning more in the city. The program also helps farmers make decisions on investing in new seeds or technology because they can plan ahead on what crops they will grow by partnering with nutritionists like Santana. Unique linkAcross Brazil, more than 1 million small farms have no formal land title deeds, according to official data. These farmers simply occupy the land where they produce or live in settlements with no formal title, but even they benefit from the program. Having a direct relationship with the state through the school feeding program helps small farmers and cooperatives to gain formal ownership over their land. Many farmers who work with Venturim on the cooperative farm lease public land from the state, but they use their earnings from school meal contracts as a springboard to gain title deeds. Formal title deeds can be difficult for small farmers to obtain; the process for formalizing land claims has been criticized as expensive, time-consuming, and bureaucratic. As Brazil is mired in political crisis and suffers its worst recession since the 1930s, analysts see the school feeding program and its support for small farmers’ land rights as a rare bright spot for public policy. Chris Arsenault covers land and resource issues for the Thomson Reuters Foundation from Rio de Janeiro, Brazil.